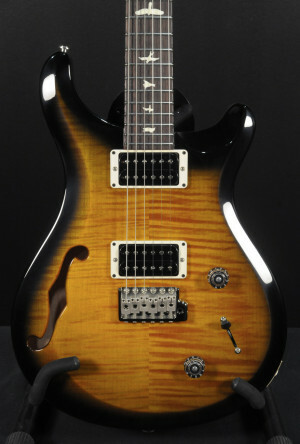 The PRS SE A40E pairs Ovangkol back and sides with a solid spruce top for full, lush tone. When matched with PRS hybrid"X"/Classical bracing, which allows the top to freely vibrate, the SE A40E's voice projects with breathtaking volume and delicate nuance. The Angelus Cutaway body shape delivers comfort and playability, well suited for picking and fingerstyle playing. With brilliant acoustics and a vast array of tones, the Hollowbody II has been a constant favorite in PRS's dynamic lineup of semi-hollow instruments. The combination of the maple top and back with mahogany sides provides tonal clarity and extraordinary resonance. Here's a 2016 PRS CE24 in a custom color - Charcoal Metallic with Black neck. It's in amazing condition. Near mint. It has scarcely been played, but should be because it plays amazingly. The 85/15 pickups are tone machines that can play any type of music from jazz, blues, classic rock, all the way to metal. With the push/pull you can get a nice Fender style single coil tone out of the neck or bridge pickups. Another great feature that benefits the tone is the brass contact points where the strings go around on the locking tuners. Paul Reed Smith himself has stated that it leads to better tone and sustain. With 24 frets the CE24 has endless capabilities and is a great addition to any guitar collection! Comes with original papers and gig bag. This guitar was owned by a collector and is in near mint condition. It has amazing sustain and is exceptionally resonant when played unplugged...so much so it almost sounds like an acoustic guitar. That kind of resonance is always the sign of a superior instrument. It's extremely light weight too....only 7 pounds 6 ounces! The frets are perfect, and the neck is straight and true. Theres a small ding at the edge of the top of the upper horn and a few extremely faint button rubs on the back. An easy 9 out of 10 condition. The tailpiece post screw on the treble side has some marks on it. The pickups and electronics all work as they should. Everything functions perfectly. The original PRS paisley case is included.